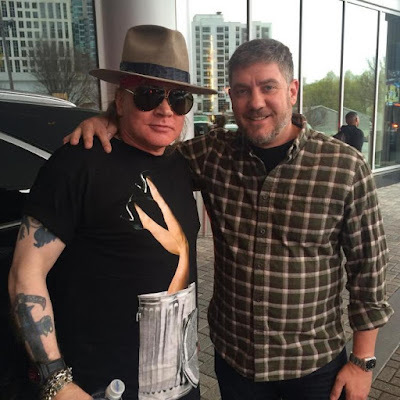 Guns N’ Roses fan Mark Guglielmo says his chance encounter with Axl Rose outside an Atlanta hotel last week partially happened because he recognized the singer’s forearm tattoo. The fan ran into the singer in front of the Loews Atlanta Hotel on Friday, and his Instagram photo with Rose has gone viral ahead of the launch of the reunited Guns N’ Roses tour next month. Caught up in the unexpected moment, Guglielmo prepared to walk away as a thrilled fan when he realized he had an opportunity to document his chance meeting with the rocker. “And then I turned away. And I was, like, 'Wait a second! ',” he thought. “Cause I was a little starstruck. I realized I had my phone in my hand. And I'm, like, 'Axl, I don't mean to bug you, but can I get a picture?' And then his, I guess, friend took the picture, and he took a good one, and I put in on Instagram, and here we are." Guglielmo managed to snag some inside Guns N’ Roses info direct from the source as he parted ways with Rose. "All I did was say 'Hey, good luck with the tour,'" he recalled. "And I corrected myself. 'I mean, the few shows.' 'Cause all I knew about was Vegas and Coachella coming up. And that's when he turned back to me, and he said, 'No, man. We're gonna do a whole tour.' He offered that to me." Rose and Guns N’ Roses will launch a 2016 tour at the new T-Mobile Arena in Las Vegas on April 8 & 9. The lineup includes Axl Rose, Slash, bassist Duff McKagan, guitarist Richard Fortus, keyboardist Dizzy Reed and drummer Frank Ferrer.